The traditional Shoo Fly quilt block pattern is perfect for beginning quilters or for any quilter who wants to create a quick quilt. The block's 6" x 6" size makes it suitable for a quilt of any size, from baby quilts to bed quilts. This floral and white-on-white version of the quilt was originally part of a quilting exchange that required specific fabrics. Choose any colors and fabrics that work for the design you would like to create. Instructions are for one 6-inch Shoo Fly block. Increase the number of patches to make additional quilt blocks. You'll find more Shoo Fly examples and the cutting instructions for 12" square quilt blocks on page 3. The cutting chart assumes you will use a quick piecing method that pairs two squares to make half-square triangle units for the Shoo Fly block's corners. It's a very good method for scrap quilts. If you are making many identical blocks for yourself, feel free to use any technique that produces 2" x 2" finished units (they should measure 2-1/2" x 2-1/2" before sewn to neighboring patchwork). The Magic 8 method explains how to make eight identical units at once. You can also sew half square triangle units on a long grid. Commercial papers and rulers are available to help you make the units. Pair a 2-7/8" x 2-7/8" white-on-white (WoW) square with a floral square of the same size. Use an easy, quick piecing method to create two half-square triangle units from the squares. Each completed unit should measure 2-1/2" x 2-1/2". 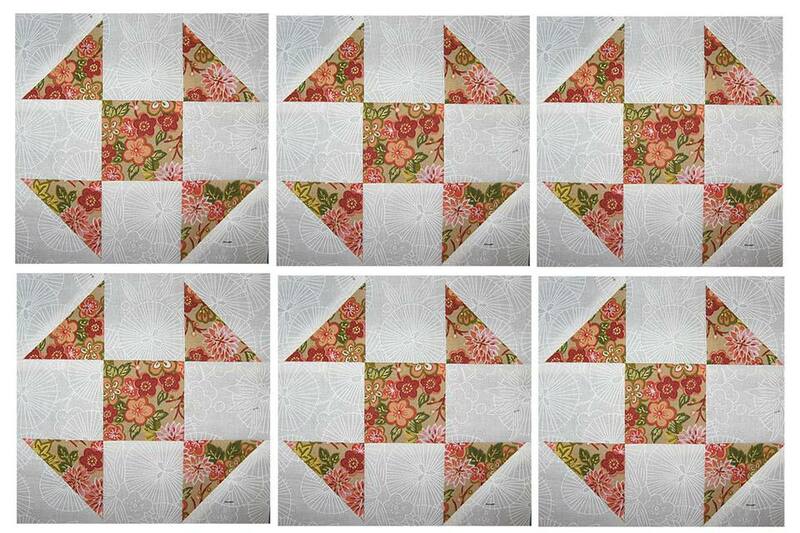 Repeat, using the remaining 2-7/8" x 2-7/8" floral and WoW squares to make two more half-square triangle units. Refer to the photograph on this page to arrange the four WoW squares, the floral square and the four half-square triangle units into three rows. Be sure to orient triangles as shown. Sew the components of each row together. Press seams towards the darkest side of the unit. Trim little triangle 'dog legs' that extend past the end of each seam. Sew rows together, butting seam allowances for a perfect match. Press. The quilt block should measure 6-1/2" x 6-1/2" If it doesn't, press again and remeasure. If the block is still off, try sewing the next block and the half square triangle seams with a scant quarter-inch seam allowance.